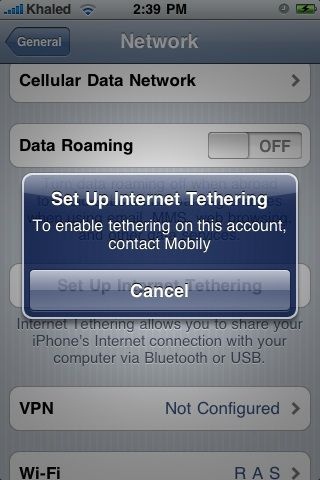 UPDATE: We just added a guide on how to enable tethering on iPhone 3G with Mobily (and even STC). I contacted Mobily’s support and the employee told me to install “pdanet”! PDAnet is a jailbroken application for the iPhone! Let me say it again, Apple’s authorized iPhone distributor in Saudi Arabia is RECOMMENDING jailbreaking the iPhone which Apple say is illegal and voids the warranty! The iPhone 3G is sold by Mobily in Saudi Arabia for four months now and their employees are still ignorant about what the iPhone 3G can and cannot do. So your option is to follow this guide which requires having iTunes 8.2 pre release or do what the Mobily employee told me, which is jailbreak the iPhone and install PDAnet! Thanks to Abdullah for posting the modified mobileconfig file. Just download the mobileconfig file on your iPhone 3G (mirror), or download it to your computer then email it. Now you can enable tethering. As for STC (Saudi Telecom) just download this mobileconfig file. To enable tethering go to Settings, General, Network, Internet Tethering, slide to ON. You can connect using the USB cable or bluetooth. Update: From Abdullah: Mobily configuration file is for post paid plans only. I ‘m having the same problem ? Actually , I bought it from Mobily but I’m using Zain SIM. Do you mean you can see the Internet Tethering option now? I have yet to install 3.0 but I am using iPhone 2G. So I have to wait for the jailbreak to release only then will I be able to use this. LOL at mobily for recommending to jailbreak! I cannot see the Internet Tethering option on my iPhone. I bought it from Mobily and am using Mobily sim card. I just would like to know if anyone was able to use MMS on iphone with STC sim? Yes – note you have to restart the phone whenever changing MMS settings for it to take effect. The settings that work for STC (under GENERAL->NETWORK-CELLULAR DATA NETWORK->MMS: APN: mms.net.sa; username & password LEAVE EMPTY; MMSC: http://mms.net.sa:8002 ; MMS Proxy: 10.1.1.1:8080 These worked for me, although initially the messages took many hours to arrive. the mobily file is for Post Paid plans only…..
That’s right, Hamed. After installing the config file, I got the Tethering option in setting. It worked with my mobily SIM. I have an alternative way. Just a few hours after Apple released firmware 3.0 to the public, some smart guy already figured out a way to hack the iPhone to allow free tethering on most carriers, including AT&T. Whatâ€™s even better about this hack is that you donâ€™t have to jailbreak your iPhone. 3. Find your country, select your provider, and tap â€œdownloadâ€. thanks, my mms and tethering are working perfectly. how do i know that my iphone is not jailbroken? is there is way to check? pls let me know. Well if you didn’t jailbreak it then it isn’t jailbroken 🙂 Jailbreaking involves manually applying a modified firmware, which I’m sure you didn’t do since you’re not sure. It would have entailed downloading the just-released Pwnage Tool 3.0 (see http://blog.iphone-dev.org/post/126465561/trois-drei-h-rom). Applying a mobileconfig file does not and cannot jailbreak the phone. nimbuzz for iphone is different than nimbuzz for nokia. in case of nokia’s nimbuzz, it gives u option to either select available wifi network or sim card’s 3g network. in case of iphone’s nimbuzz, you can only use wifi. since I have wifi at work/office, my iphone is automatically connected to these network and I use either terrasip or jumblo through nimbuzz to make my phone calls. Thanks for this post. I have an STC postpaid line and applied the mobile config file. Rebooted the phone, enabled tethering and bluetooth. Tried to pair the phone with Windows Vista via bluetooth but it gave an error due to inability to install a driver to support one of the BT components/services. Couldn’t get it to work. Then tried via USB cable, and could not find how to use the iPhone as the internet connection. Went back into settings and the tethering option had completely disappeared. Anyone actually have this working with STC and a Windows machine? The config file is only for mobily operator. I’m not sure if there is one for STC or not. You can remove it from you iPhone since it is not working. You can do that in settings -> general -> profile -> remove. There is an STC file mentioned as well with a download link, just before the end of the article. Thx for the useful tips, I have installed the mobileconfig file & sent it to my iPhone via email then installed it, put in mind im using a jailbreaked version & STC as a mobile carrier. Tethering is on, MMS settings are as shown above by Maged. I have been able to send an MMS but an error occurred on the delivered MMS msg on the other phone, I also have tried to send an MMS to my iPhone but still didn’t receive it till now..
Can u plz help me fix the problem above. Your kind support is highly appreciated. If you didn’t get an error when sending an MMS (no red exclamation next to the content–picture, contact, etc. ), then you are likely set up correctly. As I mentioned, sometimes it can take a loooong time to arrive for some strange reason. (I just did a trial 9:30 AM Saudi time and it only took 6 minutes). Last night I was able to send internationally to Egypt (Vodafone) and it arrived right away as well. I suggest a clean start–if your main interest is MMS, you don’t need tethering nor the mobileconfig file. I find on STC the tethering option disappears eventually anyway. The fact that it is jailbroken shouldn’t matter. You used redsn0w to jailbreak, or Pwnage 3.0? I assume you did the jailbreak for some specific customization/software not normaly available? Thank you Maged. I have purchased my iPhone jailbroken, since I’m an STC user. In regards, how can I figure out which jailbreaker tool was used?? and does updating my iPhone to OS 3.0 cancel the jailbreaker?? Well, if you upgraded to iPhone software 3.0 using iTunes 8.2, this definitely cancels the jailbreak. This also means your baseband (the firmware that runs the mobile radio subsystem and controls things like carrier lock, etc.) was upgraded as well. And if you’re able to use your STC SIM (and it is clear you are, and you must have activated the phone after the update, via iTunes) you have a fully unlocked phone and there is no need to jailbreak just to use it with STC. The only reason you would need to jailbreak your factory-unlocked phone, is to run customization hacks or software that is not available via AppStore, or directly access the phone file system, etc. This is different from software unlocking which is to remove a carrier-lock so that a locked phone can be used with any service provider (which it doesn’t seem you need). The carrier unlock for version 3.0 is called ultrasn0w and is expected to be released shortly. This will require a jail-broken phone to use. Does installing the MMS configurations cancel the ability to send SMS?? I have faced this with some of my friends..
(OFF-TOPIC) Manually applying MMS settings does not cancel ability to send SMS. However, you should be careful applying mobileconfig files as these can change a lot of things. (Sorry getting off the original topic of tethering…) Manually applying MMS settings does not cancel ability to send SMS. However, you should be careful applying mobileconfig files as these can change a lot of things. thank you that was helpfull and now im able to send both SMS & MMS, but i had to turn the “show subject field” in the Message OFF to be able to send SMS regularly & to send an MMS, I had to click on the small camera icon located on the left side of the message bar and choose weither to take a photo or choose an existing one. just leave it empty and write the text inside the SMS body field. The send button will remain off if you just write in the subject field. unlike other phones you need to type a single character in the SMS to be able to send it( space will be enough). in the Cellular Data APN: Type (jawalnet.com.sa) leave both user name & password empty. leave both user name & password empty. Now both MMS & Internet will work. Didn’t it ask you to install it ? when you open the email, tap on the attachment and the installation will start. I tried to download it via my phone but when i try to download, it says “Safari cannot download this file” What will I do? Pls help….. Thank you! i updated my iphone to 3.0 and did all the mms and jawalnet setting and still i dont get the small camera when trying to write a msg and i tried to restore it many times and nothing happened btw i have the internet tethering (i had it after sending the files as attachments and install it) option but not the MMS plzzzzzzzzzzz any solutions???? and i used to have swirly mms installed on my iphone would that make a difference ? Can somebody give me the Mobily settings for MMS (prepaid)? 1- Can I upgrade to v.3.0? (I did that on a pervious iPhone, and after the 3.0 update the iPhone got locked with a message that SIM carrier is not supported? 2- How can I set up voice mail on my STC SIM card? if the iPhone is sold by Mobily then yes, but you said you bought it from Axiom? THEY HAVE to fix it. the carrier update gave me wrong MMS settings. Does anybody know the manual parameters for MMS with prepaid Mobily. same here, and the funnier thing is that when i change the settings, the tethering option disappears completely! Can somebody give me the settings for MMS with Mobily (prepaid)? Can anybody give me the settings for MM with Mobily (prepaid)? Can anybody give me the settings for MMS for Mobily (prepaid)? I would like to know if this tethering is only available for the FW 3.0….because right now I am only using the 2.2.1 FW…I am not updating because I Jalbreaked my iphone and was still hesitating since there are lots of programs installed in my iphone (from Cydia). My unit came factory unlocked (probably) since I can use STC simcard from the very first day I bought it…also the guy from Mobily told me that most of the Iphone coming here in KSA is already openline (factory unlocked). Anyone have the settings for Zain KSA? Just the access point which is “web1”. Can any body advise me if i can use mobily connect card USB modem for other network provider in usa. I would assume it should work, the mobily connect card can accept other SIM cards. The connect cards that are branded with a specific carrier like Mobily or STC are usually locked to that carrier and you cannot use it with another service provider, in my experience with STC & Mobily data connect hardware. I found this true with the PCMCIA cards manufactured by Huawei), and the latest USB HSUPA Mobily connect card manufactured by ZTE. If you go to the network connection settings to try to change them, you get a big window saying with the IMEI number of the connect card, asking you to enter the unlock code from Mobily. But make sure it is for the right hardware you have. In the case of the PCMCIA connect cards from STC and Mobily, they used the EXACT same hardware with the same drivers, just each branded with the different carrier colors and logos. Yet you couldn’t use the SIM card from STC in a Mobily card or vice versa. However, you could install the s/w from one and use it with the other card by changing the network settings manually. After updating to 3.0.1, the internet tethering stopped working. I deleted the config file and now I cannot see tethering itself on my iphone 3g from mobily (postpaid). please advise what shall i do? i want to download the config file once again, but the link above doesn’t work. any suggestions? How do I add STC’s voicemail number of 0504000000 to my iphone’s voicemail box. i phone 3gs will only available on september…………mobily showroom………..
why are they delaying it ? MR. kaled do u know about the launch date of i phone 3GS…from Mobily……pls help me/…. anybody knows how to select saudi arabia in the region format and yet keep time/numbers in English. I dont like the US way of displaying numbers. I want a simple format without (-) sign appearing in the middle of a number I am dialing. How to do it? which region to select? iPhone 3gs is available in Obaikan book store. I saw that last weekend. They are selling it for SR 4,799. It is also available in iZone. is the above config for STC compatible with iPhone 3GS? is the above config compatible for iPhone 3GS? an idea when will we be able to update and not lose the tethering? Since, I could not find where to post a new topic I had to write over here. it’ seems to me apple does not care about their Arabic customers. Since, I have been trying to use their online self services like arranging a phone call with an Apple Expert who specializes in your exact question. you can talk to them now or later at your convenience. they will even call you.But, this service only available on The U.S and Canada ( disappointed ). I have the following issue and I’ll appreciate if anyone of you guys can help or just trying to help. USB Device: Bluetooth USB Host Controller, 0x05ac (Apple Inc.), 0x8213, 0x06110000 . I have been adviced to quitting Safari, and run it in 32-bit mode and see if the crashing but, its still quitting! he says you’re not gaining any performance benefit from running in 64-bit mode. Cause: There is incorrect information saved in the preferences file. to the Trash: Microsoft Messenger User Cache.plist. The Messenger Setup Assistant opens. Follow the steps in the Setup Assistant to reenter sign-in information. I just bought this mac few days ago and that gives me such a bad experience about mac products guys do u advice me to switch to windows vista instead of having all of there difficulty???? Now, it turns to Microsoft word as its quits unexpectedly too I don’t know what do with this machine on the help page it says turn off automatic problem reporting If youâ€™ve set up automatic problem reporting, you can turn it off at any time. I opened Console, located in the Utilities folder. In Console preferences, click Reset. Reopen the application by clicking Reopen in the dialog that appears when the application quits. Restart your computer by choosing Apple menu > Restart. I Restart the computer in safe mode!!!! Uninstall any plug-ins or enhancements from other manufacturers for the application. If youâ€™ve recently updated the application or Mac OS X, a plug-in or enhancement you previously installed may no longer be compatible. I just updated my machine to Snow leopard OX do u think that’s the problem !!!!! BUT HOW WOULD I DO IT ??? Open another document in the application. There may be a problem with the document you were trying to open. Use Disk Utility (in the Utilities folder in your Applications folder, or on your Mac OS X installation disc) to repair the disk. Check to see if any updates to your software are available by choosing Apple menu > Software Update. For applications not made by Apple, look for updates on the manufacturerâ€™s website. Disconnect any peripheral devices you just connected (for example, a printer). They may not be compatible with your version of Mac OS X. If disconnecting the device solves your problem, contact its manufacturer. Use Apple Hardware Test. (If your computer came with an applications installation disc, Apple Hardware Test is on that disc; otherwise, itâ€™s on the Mac OS X installation disc.) Insert the disc, and then restart your computer while holding down the D key. If you just installed hardware, such as additional memory, Apple Hardware Test can tell you if itâ€™s incompatible, improperly installed, or defective. If you canâ€™t find Apple Hardware Test, take your computer to an Apple Authorized Service Provider. Tethering function disabled when i updated to iphone 3.13.1 does not allow tethering even if you install the mobile config file!Now what?? Tethering function disabled when i updated to iphone 3.13.1 does not allow tethering even if you install the mobile config file!Now what do we do? 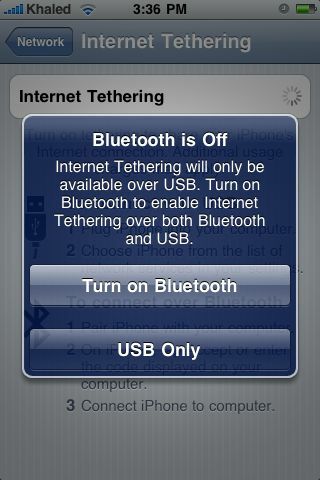 I am sorry but if you installed 3.1 then you will not be able to run tethering. Mobily is still not doing anything about it. any workaround to fix this ? I would seriously advise NOT to upgrade to 3.1. Not only will you lose tethering, but face a variety of issues, most and foremost the “coma” mode. I downgraded from 3.1 to 3.0.1. in just one week. Upon downgrading, you will lose all your SMS/MMS and settings. All others can be restored from itunes. 3.1 of iphone is like vista of MS. Apple’s own forums for 3.1 problems on 3G has reached 131 pages without any solution or even acknowledgement of the problem from Apple. Also google “iphone 3.1 coma” and you will find many sites reporting this problem. I have upgraded my iPhone to 3.1 and I need to downgraded to 3.0.1. Do you recommend any site that shows how to do it step-by-step. even if I lose my SMS/MMS and settings, it is not an issue for me as long as I can get the tethering working. This youtube video shows all. Be very careful and do exactly as said. You will have to download a file named iPhone1,2_3.0.1_7A400_Restore.ipsw (241.30MB) – google it! REMEMBER to press SHIFT key which clicking on restore. how can I restore it back from 3,1 to 3.0 in order to enjoy the internet tethering. Tethering problem solved! by the new update! tethering worked like charm no problems at all! help me!! internet setting of ZAIN saudi arabia . . i need APN what will i put on it???!!! tnx . . .hope somebody can help me on this .. .
Yo realmente verdad disfrutar de la lectura Sitio, contiene buenos mensajes|contenido.